This week, The New Yorker published a 12,000-word piece written by Salman Rushdie about the famous fatwa, and its immediate aftermath. It's an absolutely riveting story. — I don't know that I've ever seen the actual text of the fatwa issued by Ayatollah Khomeini, but here it is, quoted in the story's opening lines: "I inform the proud Muslim people of the world that the author of the 'Satanic Verses' book, which is against Islam, the Prophet and the Koran, and all those involved in its publication who were aware of its content, are sentenced to death. I ask all the Muslims to execute them wherever they find them." Awfully chilling and stark, isn't it? 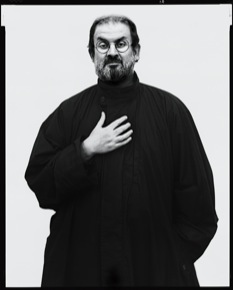 — On the morning the fatwa was issued, Valentine's Day 1989, Rushdie attended a memorial service for a friend. Martin Amis was there, and expressed his concern for Rushdie's safety. The novelist Paul Theroux was also there, and expresses something approximately opposite to concern, joking "I suppose we’ll be here for you next week, Salman." — These lines, that wrap up the first section of the piece, reflecting on the day the fatwa was issued, are chill-inducingly good: "On this day there were crowds marching down the streets of Tehran carrying posters of his face with the eyes poked out, so that he looked like one of the corpses in “The Birds,” with their blackened, bloodied, bird-pecked eye sockets. That was the subject today: his unfunny Valentine from those bearded men, those shrouded women, and that lethal old man, dying in his room, making his last bid for some sort of murderous glory." 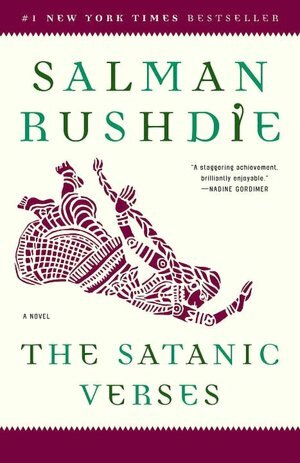 — Rushdie discusses his inspiration for the novel The Satanic Verses (as well as what he believes to be his future oeuvre): "...the great question of how the world joins up—not only how the East flows into the West and the West into the East but how the past shapes the present even as the present changes our understanding of the past, and how the imagined world, the location of dreams, art, invention, and, yes, faith, sometimes leaks across the frontier separating it from the “real” place in which human beings mistakenly believe they live." — The Satanic Verses was published Sept. 26, 1988 in England. It was banned in India (a friend of Rushdie's in the Indian government called him to break the news) in early October. On Oct. 10, he received his first death threat. Many more followed. Rushdie, of course, was taken aback by the fury: "To him, it was the least political of (his) three books. And the material derived from the origin story of Islam was, he thought, essentially respectful toward the Prophet of Islam, even admiring of him." — And, suddenly, two-thirds of the way in, a turn for the sentimental: "He became, in the media, a man whom nobody loved but many people hated." — Semi-disingenuous-sounding (on purpose) apology offered soon after the fatwa, in exchange for continued protection from the British government: "As author of 'The Satanic Verses' I recognize that Muslims in many parts of the world are genuinely distressed by the publication of my novel. I profoundly regret the distress that publication has occasioned to sincere followers of Islam. Living as we do in a world of many faiths this experience has served to remind us that we must all be conscious of the sensibilities of others." — D'oh! “'Even if Salman Rushdie repents and becomes the most pious man of all time, it is incumbent on every Muslim to employ everything he has got, his life and his wealth, to send him to hell,' the dying imam said." — John Irving, comedic genius: "When the book was in its third consecutive week as No. 1 on the New York Times best-seller list, John Irving, who found himself stuck at No. 2, quipped that, if that was what it took to get to the top spot, he was content to be runner-up." — The last part of the piece chronicles Rushdie hiding out under the protection of two guys named Stan and Ben. At one point, there's a scare (that turned out to be just a misunderstanding) regarding his ex-wife and son. And then, Rushdie, at the behest of his protectors, renamed himself Joseph Anton (the first names of two writers he admired, Conrad and Chekhov). "He had spent his life naming fictional characters. Now, by naming himself, he had turned himself into a sort of fictional character as well." Sweet! Thanks for the link! Satanic Verses didn't strike me the way Midnight's Children did, but he's definitely led an interesting life. I need to read more of his books. I'm going to an event with him next week and can't want to see what he has to say. I'm interested in Rushdie's Joseph Anton memoir .... but I didnt realize it was written in the third person. That might likely drive me crazy. Ugh.